Tomorrow sees England face Wales in their Euro 2016 group stage match. The derby clash will take place the day after the 20th anniversary of when England last took on a fellow British side in a major tournament. 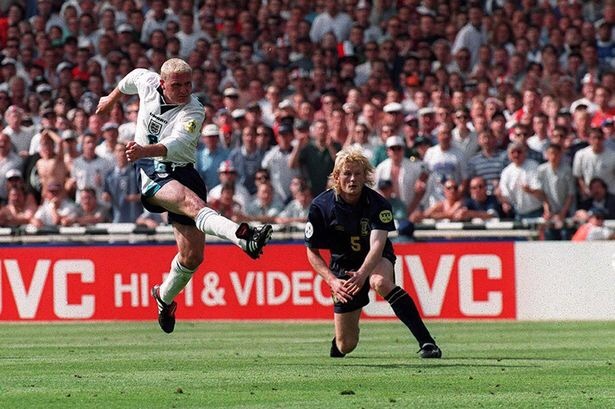 Scotland visited Wembley during Euro ’96 to face the hosts, with a moment of brilliance from Paul Gascoigne ensuring it would never be forgotten. From the moment the draw was made for the 1996 European Championship, there was hype about England playing Scotland. The sides had not met for seven years since their annual jousts ended and the fact they would now be meeting in a major tournament hosted by England gave the fixture added spice. England’s frustrating draw with Switzerland in the opening match meant they could ill-afford to slip up again, experiencing a week-long wait to take on the Scots due to UEFA’s scheduling of the group stage (which had the group seeds playing their first two matches at weekends and the other games played in midweek). The previous decade had seen a reversal of the traditional one-way traffic between Scotland and England of leading players, with Rangers having managed to sign a number of England internationals. Although the return of English clubs to Europe and the creation of the Premier League in the early 1990s helped the traditional order to be restored, in the summer of 1995 Rangers signed English star Paul Gascoigne from Lazio. It brought Gazza back home to British football. 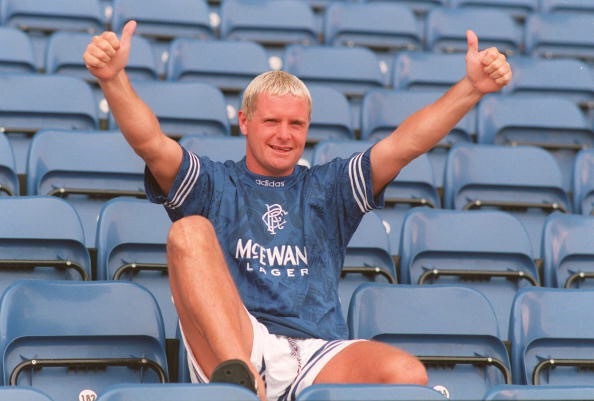 Paul Gascoigne returned to Britain in 1995, joining Rangers. When the Euro ’96 draw was made, it meant Gascoigne could enjoy months of pre-match banter with the Scotland contingent in the Rangers squad such as goalkeeper Andy Goram and striker Ally McCoist. “For the previous few months I’d taken so much stick in the Rangers dressing room. They told me all the time how they were going to stuff England,” Gascoigne recalled in his autobiography. This was one fixture Gascoigne was not going to want to miss. But not everyone shared Gascoigne’s desire to see him involved in the match. He had been a star at the 1990 World Cup, but since then he had experienced two lengthy injury lay-offs and he had been a constant source of media attention – not all of it positive. Gascoigne was taking much of the blame for alleged incidents on England’s infamous pre-tournament trip to China and Hong Kong. Then, during the draw with Switzerland he made little impact and was substituted. Doubts were being cast upon how successful he could be during the tournament, with plenty of negative press coverage coming his way. Gascoigne would go knocking on boss Terry Venables’ door the night before to seek assurances he would play. According to Gascoigne, Venables told him he wouldn’t be picking him and kept the pretence up for some time before finally admitting he was in. There was a mutual affection between Gascoigne and Venables, having previously worked together at Tottenham Hotspur. Not every manager would have been so willing to stand by Gascoigne amid the recent headlines. Gascoigne scores his unforgettable goal against Scotland. At half-time against Scotland, there was anxiety in the air. England were drawing 0-0 and showing little sign they could win. If they didn’t do so, they’d be in serious danger of going out in the group stage on home soil. The BBC panel were again offering criticism of Gascoigne, while in the Wembley changing room Venables was making a substitution. Some would have been happy to see Gascoigne hauled off, but instead it would be defender Stuart Pearce in a tactical switch. Jamie Redknapp was brought on, providing an extra midfielder. With the Scots still reeling from the miss, England broke away. 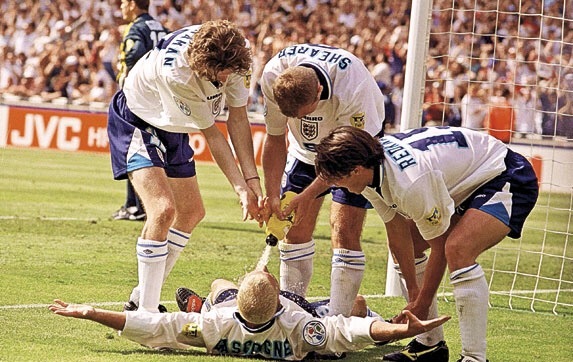 Anderton found Gascoigne, who would memorably flicked the ball over Colin Hendry before volleying home. It wrapped up England’s win and ignited their campaign. It would forever stand out among the most famous England goals. Writing in his autobiography, Gascoigne recalled the goal. “I was about on the corner of the Scotland box in between two defenders,” he wrote. “When the ball came through to me Colin Hendry was moving over to close me down. I just knew where he’d be, when he’d commit himself, so I knew what to do. It felt brilliant when it all worked. I went to look like I’d knock it past him and try and go round the outside, but I changed direction and flicked it over his head with my left foot. Hendry tried to get back to me, but ended up on the deck, and I volleyed the ball with my right into the corner of the goal, past Andy Goram, my Rangers team-mate.” Almost as memorable as the goal was the celebration, Gascoigne and colleagues performing the ‘dentist’s chair’ routine to make light of incidents on the pre-tournament trip to Asia. For England the campaign was up and running, while Gascoigne was back as a national hero. ‘Mr Paul Gascoigne: An Apology’ screamed the front page of the Daily Mirror, with a somewhat at tongue in cheek story after his goal. For Gascoigne the comparisons would exist between the tournaments of 1990 and 1996, even though his injuries in the meantime meant he was not likely to be quite the star this time around at he had been at Italia ’90. In both competitions there would be heartache against the Germans in the semi-final and an incident that lived long in the memory. In 1990 it had been his tears after receiving a booking that ruled him out of the final if England got there; six years on it was the sight of him literally being inches away from getting the touch needed to turn in Alan Shearer’s cross. Had it been the other way round, Shearer would almost certainly have scored. It was an incident that would barely have been recalled had England gone on to win, but their shoot-out loss means it has continually been brought up – the moment England could have won through to the final and probably have won the whole tournament. Gascoigne would never play in another major tournament. He had thrived under Terry Venables but with successor Glenn Hoddle – like Graham Taylor before him – the relationship was more complex. His controversial omission from the 1998 World Cup squad marked a sad end to an incident-packed international career. He had only played in two major tournaments, but in both he left lasting memories as England so nearly reached the final.